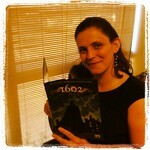 As those of you who follow my blog or chat with me on Twitter already know, I adore science fiction. I did a decent amount of science fiction reading this summer, but not nearly enough to slake my thirst for new titles. Since I can't keep calling it #SciFiSummer now that the summer is winding down, I'll have to transition to a new catch phrase. If you have any thoughts, let me know! This past week I have been reading an Urban Fantasy (The Raven Boys), so I decided to take this Friday to review some science nonfiction I have been reading. After all, you can't have Science Fiction without Science Fact, right? The recent excitement over the Mars Curiosity Rover has reignited my interest in space exploration. As a little girl, and a not so little teen, I was passionate about science. I watched many of the shuttle launches live. (On television, unfortunately, never in person). My very first book review was about an astronomy book. I got paid actual money for that one! Today in 2006, Pluto was "demoted". While I felt a bit sad for the poor little blighter, its reclassification is a wonderful opportunity to teach about one of the tasks scientists perform. 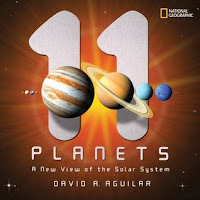 11 Planets is a book that would have delighted the younger me. The opening page includes the winning entry in a contest to create a new mnemonic device to remember the names of the planets. (I'll confess, I didn't really need that when I was a kid. I could say them forward and backward at equal speed, and then regale you about how Pluto wasn't always in the ninth spot due to the shape of its orbit). Each planet has a double page spread, accompanied by stunning illustrations, well explained information, and a tidbit about the origin of the name of the planet. (Another confession - I've always loved mythology, too). Overall: This book is perfect for upper elementary students looking for an overview of our solar system. Copyrighted in 2008. I'm sure there is already some information that is out of date.. but that's the way of the field. Look to the Stars was written by Buzz Aldrin. I was sold, right there. The last time humanity visited the moon I was only a few weeks old. Who knows when we will return? This book is a perfect overview of the history of space exploration. The paintings by Wendell Minor that illustrate each page are detailed and vivid. What I like best, though, is the personal touch. I can hear the voice of Buzz throughout the book, nudging me to take up a journey myself. I teared up a little on the page that included the quote by Christa McAuliffe, "I touch the future. I teach." I want to hand this book to children and see if it inspires them to dream of exploring beyond our tiny corner of the universe. The students I inspire today may be the generation that ventures out permanently into the final frontier. I plan to use this book as a model in my space exploration unit. What I'd like to do is have students create their own addition to the book. Whether they extend the tale through current facts or science fiction, I'd love to see what they can add. The book came out in 2009 and so doesn't include Space X or the recent Mars rovers, and it includes some "facts" about US space exploration plans that have altered in the years since it came out. 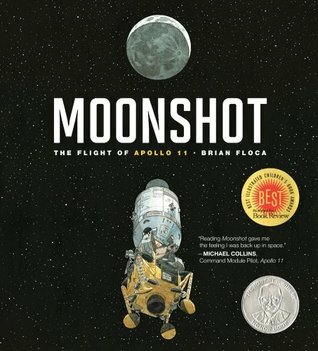 Moonshot was a much simpler book, and tells the story of Apollo 11, the first landing on the moon. 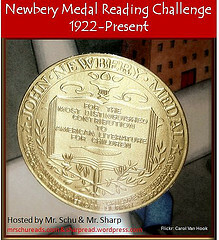 The text is leveled for a much younger audience, and would make a solid read aloud in younger grades. The endpapers had fabulously detailed text and images, though, which could appeal to children who wanted more information or serve as excellent background information for the teacher. I enjoyed the illustration style in this one, with simpler drawings and a lot of white space. Within the story of the actual Apollo astronauts, there are illustrations that include a family eagerly following the mission. The anticipation, anxiety, and thrill is clear on their faces along the way. I have only two real problems with this book. The first involves the family that follows along with the mission. While they are glued to the television, mom is right there with the dad and children and is clearly engaged. On the first and last page images, though, she is nowhere to be seen. Really? That is a shame. The second is the language of the text. There are times when it is clearly trying to be lyrical, but falls flat. 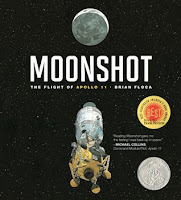 The story of Apollo 11 is so incredibly thrilling that I was disappointed by the fact that the text wasn't as beautiful as it could have been. I still have several space related nonfiction books to read and review. Check back next week! While you are waiting - take some time to follow some awesome twitter feeds. @NASA, of course, always has up to date information. @TweetsOutLoud is the feed of the JPL engineer now fondly known as the "mohawk guy". Sue me, he's cute. @MarsCuriosity - is a first person feed run by NASA social media experts. It is wonderful! Can you say "Personification" instruction in science, anyone? Also a great way to teach voice, as you feel like the Rover has its own personality when you read the feed. @N165Mars is another fun one. Someone (I'm not sure who) created a feed in the voice of a small rock on Mars. This was the first rock "zapped" by the Curiosity Rover. Remember - you can't have science fiction without SCIENCE!